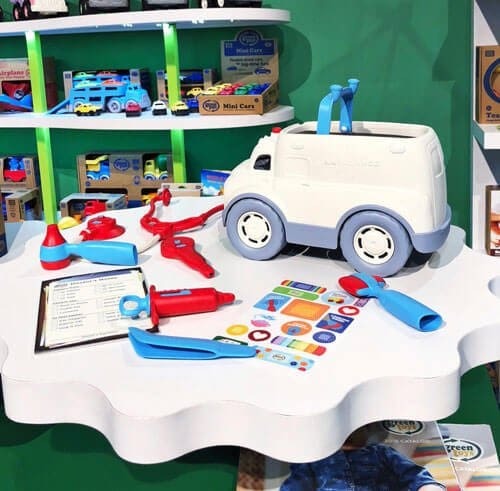 Last month was the annual ABC Kids Expo and I’ve finally been able to sit down and compile favorite products from the show! For those who may not know, ABC is a juvenile-products trade show that happens each fall in Las Vegas. 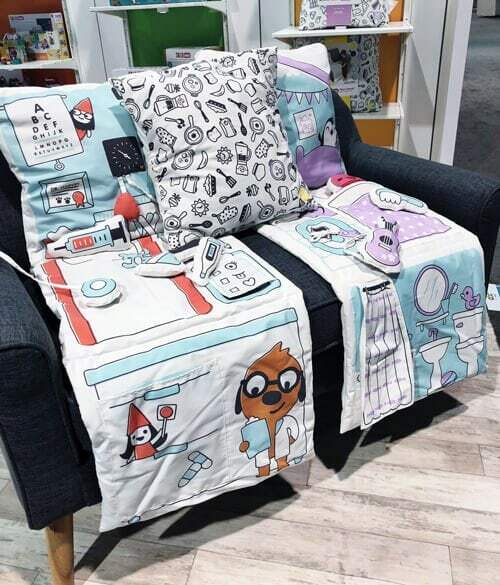 The last four years I’ve attended to scope out the latest baby gear to hit the market and discover new products. It’s a lot of fun! I always love sharing my favorites with you – here are my top 50 from this year. 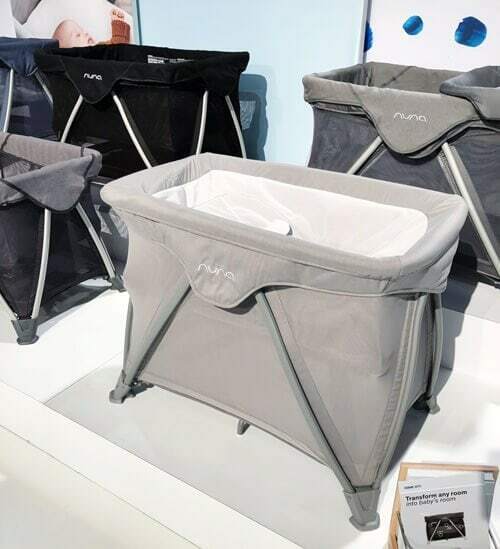 The Halo DreamNest is a 3-in-1 sleep system that can first be used as a rocking bassinet, then as a portable crib, and finally as a stand-alone travel cot. It features an open-air sleep system with a mesh mattress that is breathable and prevents overheating. AVAILABLE NOW FROM WALMART. 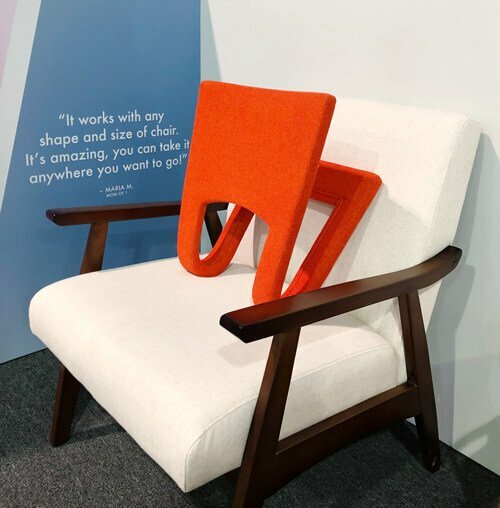 The Ready Rocker was one of the most exciting new products at the trade show! It turns any regular chair (or couch, bed, or wall) into a rocking chair! Just position it where it’s most comfortable, and get rockin’. It’s great for being on-the-go, small spaces, or for the grandparents’ house. AVAILABLE NOW FROM ROCKERMAMA. The BabyBjorn feeding line is getting an upgrade! 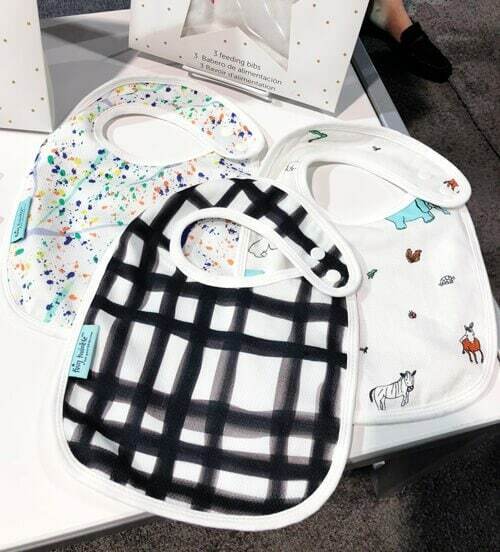 All of your favorite products will soon be available in gorgeous pastels, plus they’re adding a new small bib that will make a perfect first bib for baby. AVAILABLE MAY 2019. 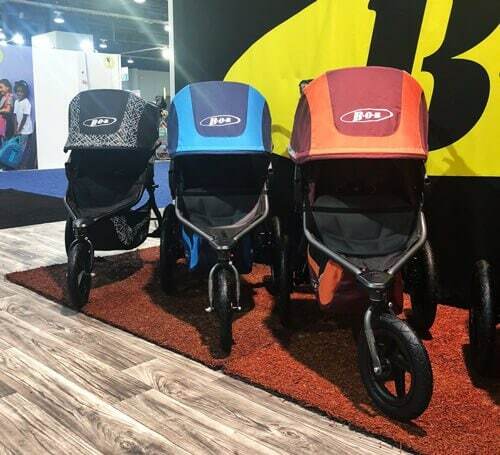 The Baby Jogger City Tour 2 Double Stroller is Baby Jogger’s most compact double stroller! It’s just 26″ wide and weighs only 22 pounds, making it ideal for travel. It has two UV50+ canopies, individually reclining seats with near-flat recline, adjustable calf support, and a one-handed fold. It also accepts two bassinets, making it a great option for twins. AVAILABLE MAY 2019. 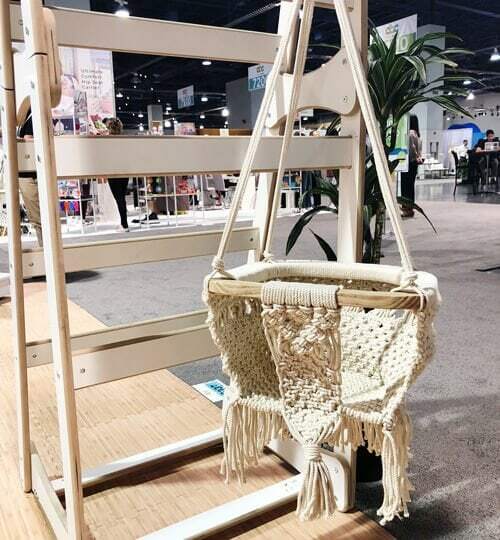 This macrame baby swing was a show stopper at the baby expo! It’s handmade by artisans in India using 100% organic cotton and supports babies and toddlers up to 50 lbs. AVAILABLE NOW FROM FINN + EMMA. Clek fans rejoice! 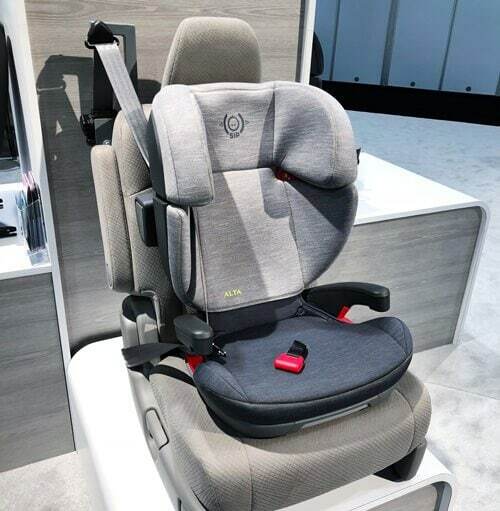 The beloved car seat brand is finally releasing an infant car seat! 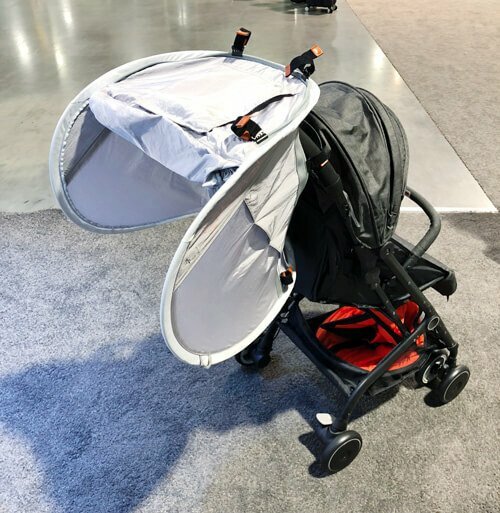 The Liing weighs just nine pounds and has a one-handed quick-release that makes it easy to remove from the base or a stroller. It has an effortless and secure installation whether using LATCH or the Belt-Tensioning System (with the base) or using the European Belt Path (without the base). The recline is adjustable after the base has been installed, and it has an adjustable canopy with a mesh peekaboo window. AVAILABLE NOW FROM PISHPOSH BABY. The Baby Carrier Mini was specifically designed for babies from birth up to 25 lbs. 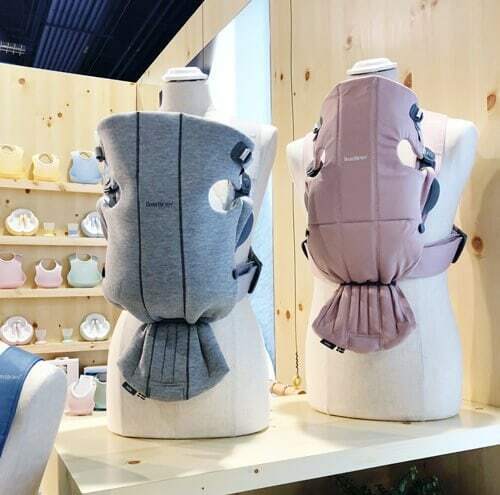 It’s a small and easy-to-use baby carrier that allows you to quickly unfasten the front section and lift out your sleeping baby without waking them. 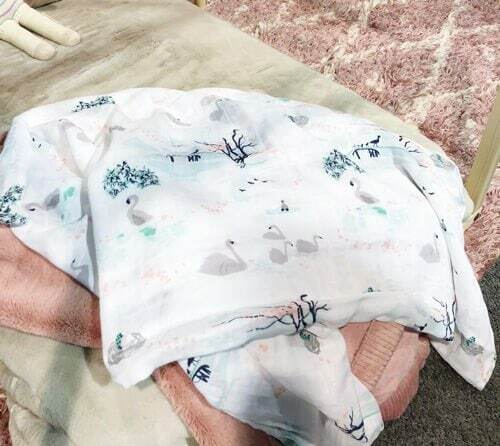 It positions your baby high on your chest, and the super-soft fabric is soft against baby’s skin. AVAILABLE NOW FROM AMAZON. 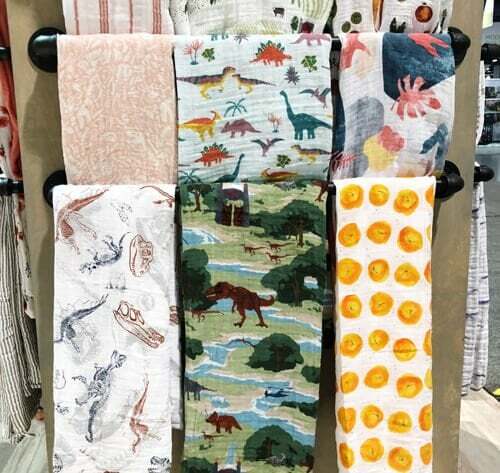 The Little Unicorn + Jurassic World Collection includes individual muslin swaddles, swaddle sets, quilts, and hooded towels. AVAILABLE NOW FROM LITTLE UNICORN. Baby blowouts are going to happen. With these Soak & Save Bags, you can pretreat stains on the go – simply toss the garment into the bag, add water, and seal. Then, wash it later! 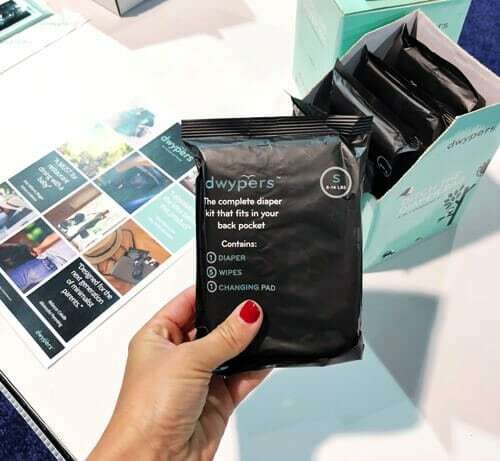 Each pack includes three single-use, leak resistant soaking bags, and non-scented water-soluble detergent pods. AVAILABLE NOW FROM AMAZON. Designed by Dr. Harvey Karp, the Sleepsea makes it possible to safely and securely swaddle your baby in just five seconds. It features an inner band to keep your baby from breaking out, a “quiet” velcro that won’t disturb baby, and a two-way zipper for easy diaper changes. AVAILABLE NOW FROM HAPPIEST BABY OR AMAZON. 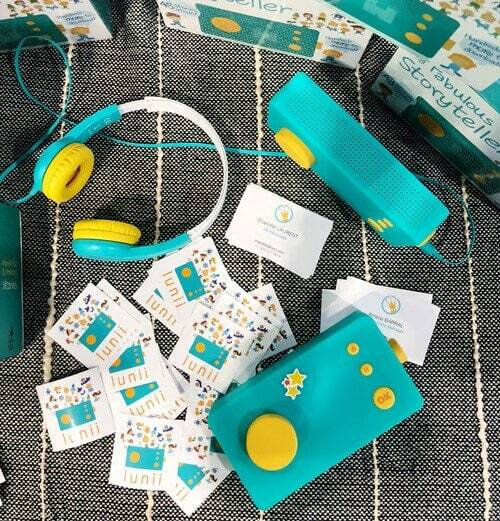 With the Lunii storyteller, your child can create their own adventure by choosing various story elements (the hero, setting, second character, and an object) by turning the dial. Once the elements are chosen, the narrator tells the story which lasts from 3 to 7 minutes. The Lunii comes with 48 stories with additional stories available for download. Fun for bedtime stories or while traveling. AVAILABLE NOW FROM AMAZON. 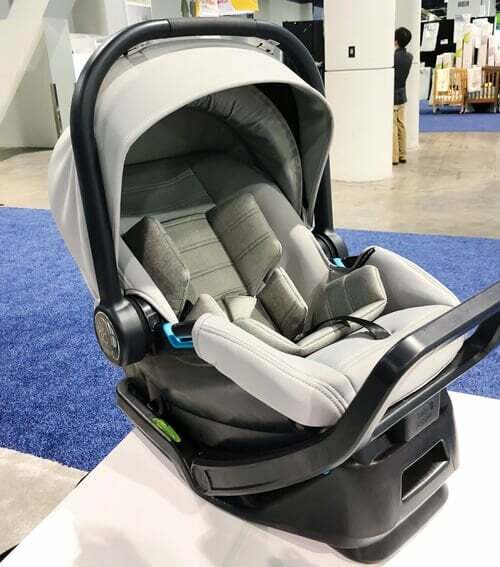 UPPAbaby fans, the brand is releasing their first-ever convertible car seat! The KNOX features the SMARTSecure System that provides visual confirmation that the seat is installed correctly. 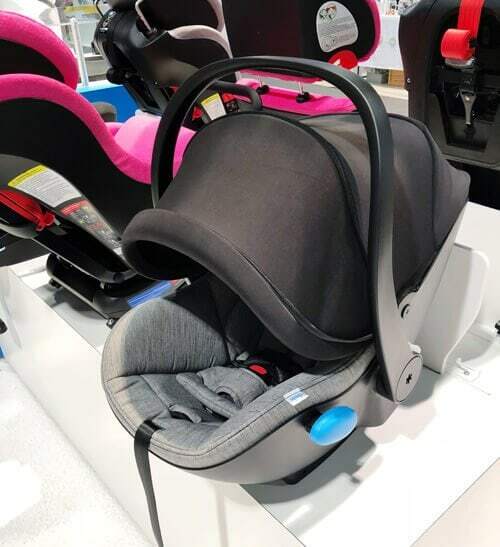 There are also a variety of safety features like SMART SIP Absorbing Pods on the shell that disperse forces in a side impact crash, and a Universal Tether that reduces seat rotation and stress on the child’s head and neck in a collision. AVAILABLE SUMMER 2019. The dishes in this silicone meal set have non-slip bottoms, making it easier for babies to learn to feed themselves and reducing mess. 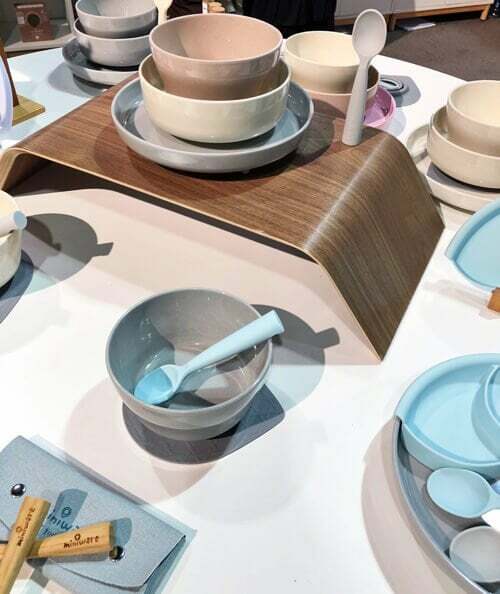 The four-piece set comes with a plate, bowl, cup, and spoon. Microwave and dishwasher safe. AVAILABLE NOW FROM AMAZON. Freshly Picked is introducing high top sneakers into their line-up! They’re made of genuine leather and have a back pull tab and elastic laces for easy-on and off. AVAILABLE NOW FROM FRESHLY PICKED. The Cove Aire is a travel crib that doubles as a bedside bassinet. It has a contoured napper with an adjustable recline to keep newborns comfortable. When baby is old enough, the napper can be removed to reveal the full-size bassinet. And when your baby graduates out of the bassinet, it can be removed and the Cove Aire used as a travel crib. 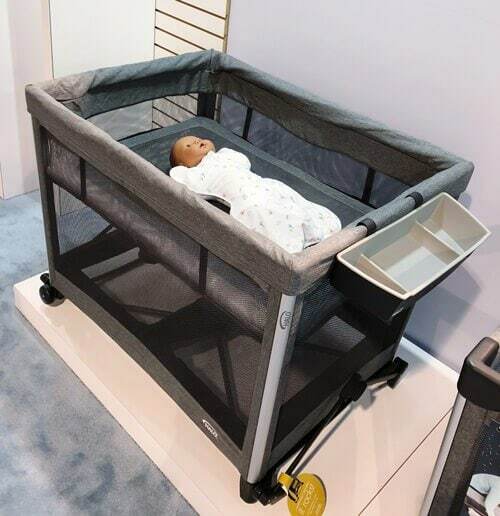 It’s narrow so it fits nicely beside your bed, and the breathable mesh sides keep baby safe by allowing air to flow through. AVAILABLE SPRING 2019. These beautiful sleep bags from Kyte Baby are made from bamboo, which is breathable, silky soft, and eco-friendly. It’s also gentle against your baby’s fragile skin. These sleep bags have double zippers and are available in a variety of solid colors. AVAILABLE NOW FROM AMAZON. Meet the new ultra-stylish convertible stroller from Thule. 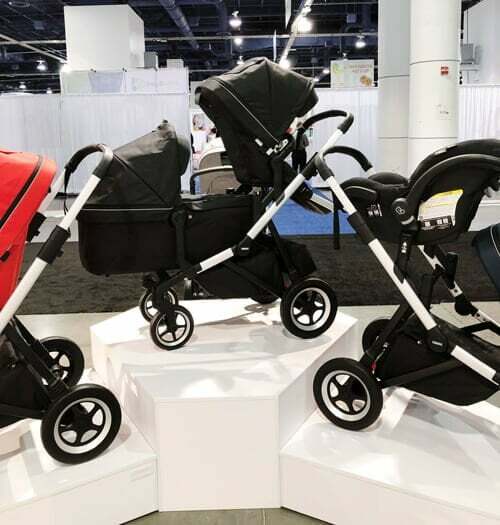 The Sleek can be a single stroller or configured as a double or twin stroller with the addition of a sibling seat, infant car seat(s), or bassinet(s). You can even accommodate three kids with a glider board. It features a reversible seat, large seating area, and a large cargo basket with zip-top cover. AVAILABLE NOW FROM NORDSTROM. Re-Play has added a Straw Cup to the line-up! 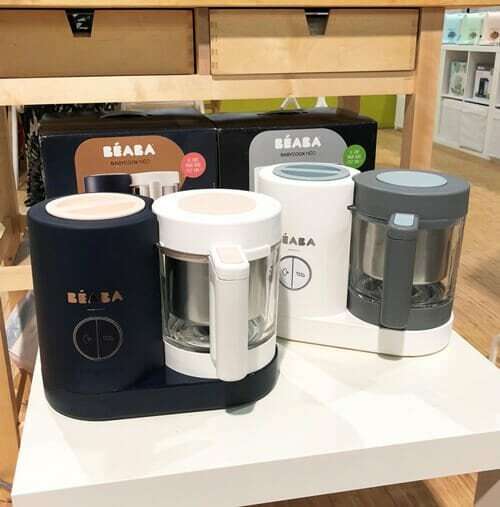 You have the option of buying the full Straw Cup, or if you already have their No-Spill Sippy Cups you can just buy the Straw Cup Lid, which fits perfectly. AVAILABLE NOW FROM RE-PLAY. 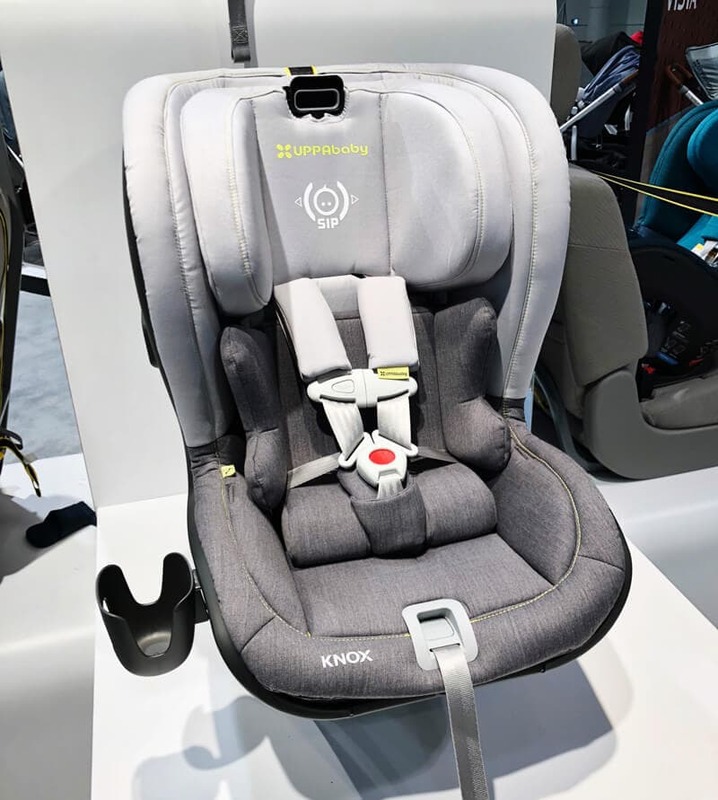 At just 7.8lbs (including canopy + drape), the City GO Air Infant Car Seat from Baby Jogger will be one of the lightest infant car seats on the market when it’s released! It has a taxi-safe belt path for when you’re on-the-go, and the base has RAPIDLOCK belt-tensioning installation. Features an integrated anti-rebound bar and a canopy visor with drape extension for full coverage. AVAILABLE JUNE 2019. 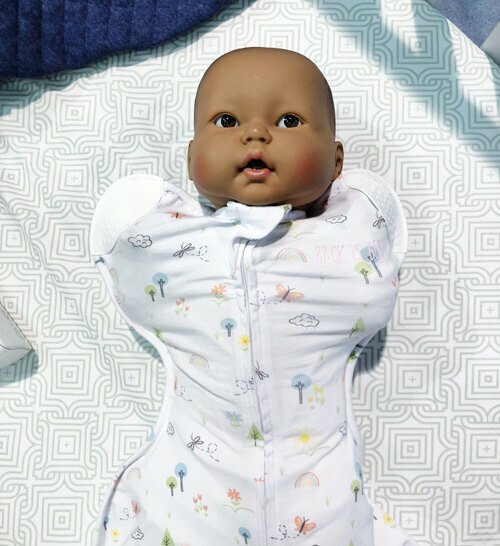 The Self-Soothing Swaddle is perfect for the baby who doesn’t like arms down swaddling and likes to chew on their hands. It has inner pockets to secure your baby’s hands and reduce the startle reflex, and silicone teethers to provide gentle relief to baby’s gums. AVAILABLE NOW FROM AMAZON. The complete diaper kit that fits in your back pocket…or the glove box, or in the stroller, or in your handbag. (You get the idea.) Each pouch contains one diaper (based on selected size), five wipes, one disposal bag, and one changing pad. AVAILABLE NOW FROM DWYPERS. Like their original baby food maker, only better! The Babycook Neo is an upgraded model with a glass bowl and a stainless steel steam basket (versus plastic on the original). AVAILABLE NOW FROM ALBEE BABY. 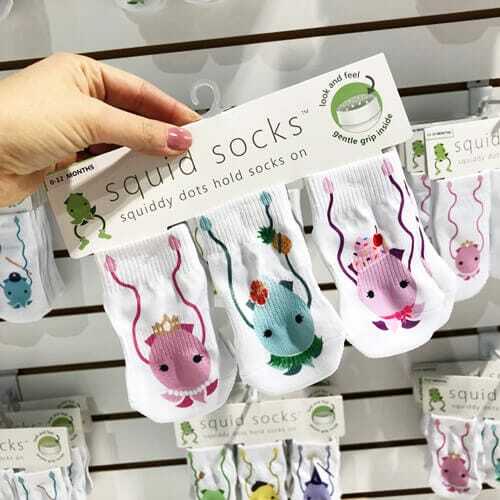 Squid Socks have “squiddy dots” (silicone dots) on the ankle that hold little socks in place. Yep, baby socks actually stay on! Plus there are extra grip dots on the bottom to prevent falls. AVAILABLE NOW FROM SQUID SOCKS. There are so many things to love about this night light! It’s soft and it doesn’t get hot, so children can cuddle them in their beds. The color can be changed by tapping them, or they can be controlled with a remote. Plus they are portable, so kids can carry them to the bathroom at night. AVAILABLE NOW FROM AMAZON. The Cinemood is a 5″ portable smart projector! It comes pre-loaded with 120 hours of kid-friendly content including Disney. Users can also connect to WiFi and stream from their personal Netflix or Amazon Prime Video accounts, or download content to watch offline. Perfect for family nights, sleepovers, car or airline travel, camping, or backyard get-togethers. AVAILABLE NOW FROM TARGET. 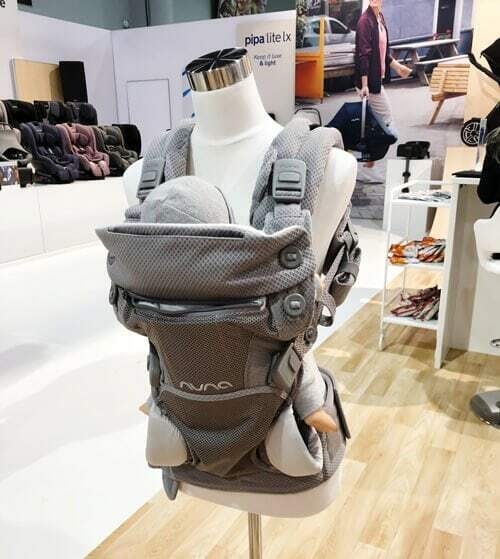 Meet Cudl, the first baby carrier from Nuna! It supports children from infancy up to 3 years in four carry positions (facing in/infant booster, facing in, facing out, and back carry). Instead of bulky buckles, it features magnetic closures and it has an innovative leg opening button adjustment for smaller babies. No insert is needed for newborns as it has an integrated infant booster and removable infant head support. AVAILABLE NOW FROM NORDSTROM. Basecamp is a lightweight playard that pops up in seconds! 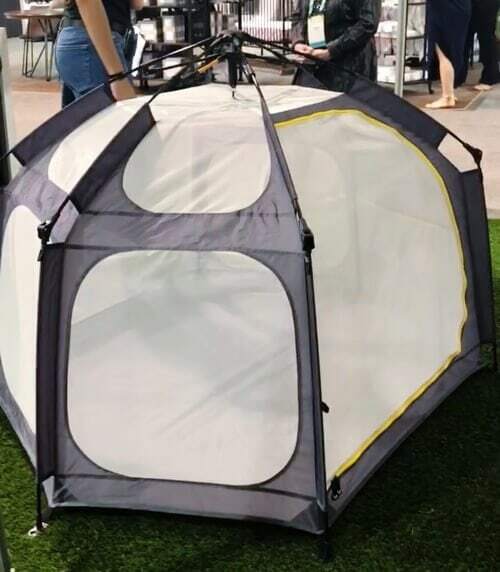 It weighs under five pounds, has a 360-degree view, sunshade, and a waterproof floor. It easily collapses down and comes with a carrying bag that attaches to the side of your Veer Cruiser. (Although you’re probably going to want one even if you don’t have a Veer!) AVAILABLE FOR PRE-ORDER FROM ALBEE BABY. 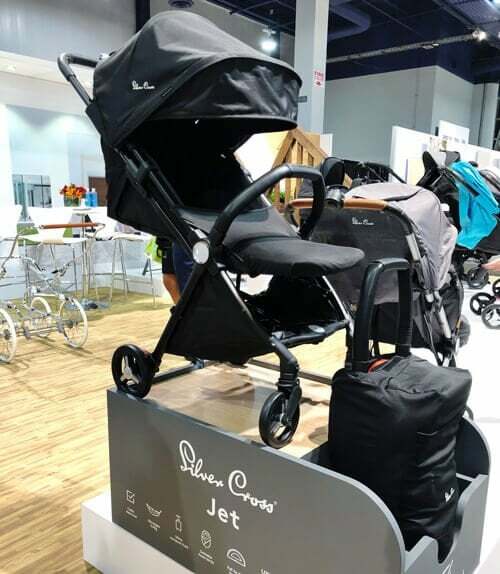 The Silver Cross Jet is an ultra-lightweight, compact travel stroller that collapses down small enough to be stored in the overhead bin of an airplane. My favorite feature of this stroller is that when it is collapsed, the belly bar becomes a luggage handle so it can be wheeled around like a small suitcase. 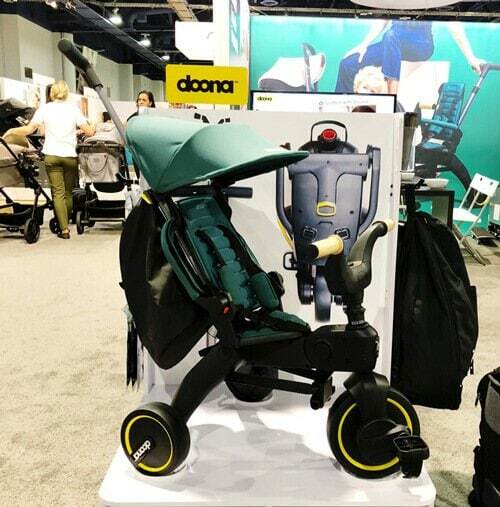 Unlike many other travel strollers, it can become a travel system with an adapter making it compatible with the Cybex Anton, Maxi-Cosi, or Nuna Pipa. It weighs just 13 lbs, can accommodate toddlers up to 40 lbs, and comes with a luggage sleeve cover and a rain cover. AVAILABLE NOW FROM PISHPOSH BABY. A fully microwavable plush soft toy. The are filled with flaxseed and fragranced with dried lavender. Once heated, they stay warm for up to 45 minutes. AVAILABLE NOW FROM AMAZON. 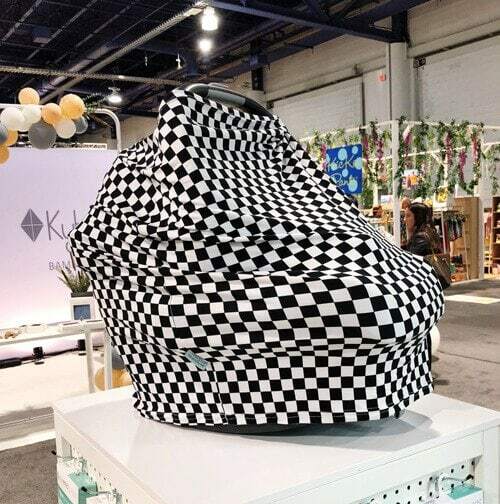 The KOOÏ cover was originally developed as a nursing cover that attaches to your stroller to provide space and privacy, but parents soon discovered it also is great for privacy while potty training or changing your child’s clothes while out in public (like at the swimming pool). AVAILABLE NOW FROM KOOÏ. The first-ever booster seat from UPPAbaby will accommodate children from 40 to 100 lbs. It features the SECUREfit belt routing system that ensures a proper fit for both lap and shoulder belts and it has a unique lap belt positioner to prevent belt slippage and misplacement. The rigid LATCH connectors secure the seat in the vehicle and ensure proper alignment. AVAILABLE SUMMER 2019. The world’s most compact folding trike! It’s a four-in-one trike that fits kids from 10 months up to 36 months first as a push trike and then a tricycle. It folds and unfolds with just the push of a button and folds down compact. AVAILABLE SPRING 2019. 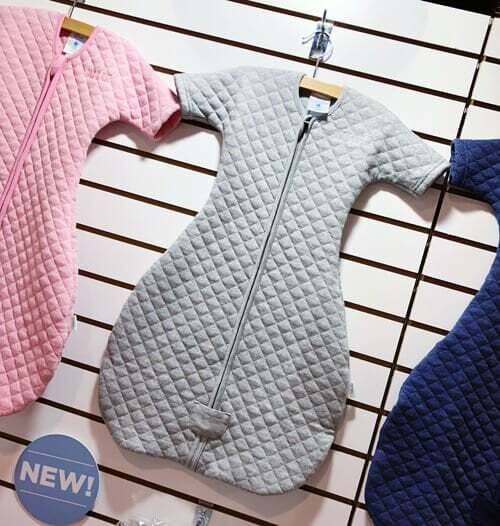 The SleepSack easy transition wearable blanket makes it easier when the time comes to stop swaddling your baby. The unique sleeve design reduces the startle flex without overheating, and since the arms are free it’s safe for little ones who are rolling. AVAILABLE NOW FROM AMAZON. Saranoni has released a line of adorable bamboo swaddle blankets based on classic storybooks. Currently includes The Ugly Duckling and The Tortoise and the Hare, with more coming soon. AVAILABLE NOW FROM SARANONI. 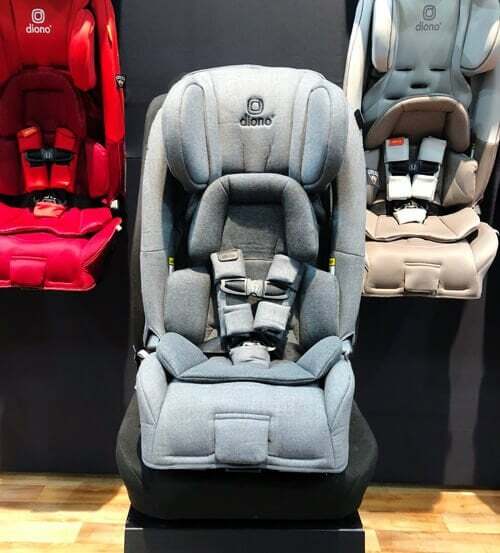 Diono recently refreshed their full line of convertible car seats. They have updated fashions, a full-fabric back cover, new harness buckles, and are available at a lower price point! The series has been renamed too, with a “3” indicating the seat fits three across in most mid-sized vehicles and a “2” indicating two across. AVAILABLE NOW FROM AMAZON. I don’t think the Cactus trend is going to end any time soon! 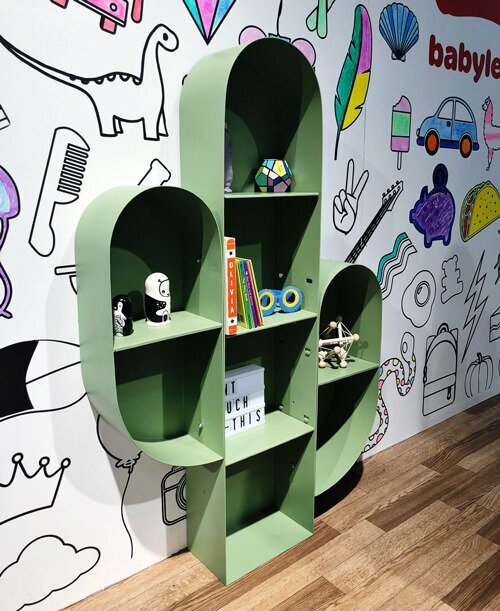 Isn’t this bookshelf from Babyletto just the cutest? AVAILABLE SUMMER 2019. 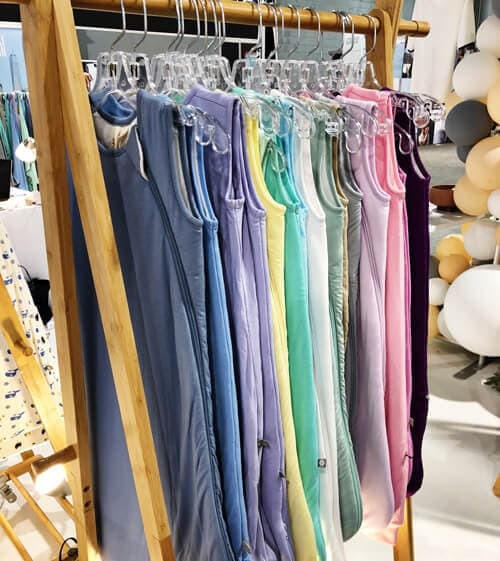 Last fall Covered Goods released their new Buttery Soft Touch fabric (it’s so good) and this year they’re adding more prints to the line. Our personal favorite is Checkers so you can match your retro Vans, but this is just one of many new releases. AVAILABLE NOW FROM COVERED GOODS. Robeez is stepping up their game! Lots of trendy new styles are joining the line-up in January, including these espadrilles and some adorable mary janes. AVAILABLE NOW FROM ROBEEZ. 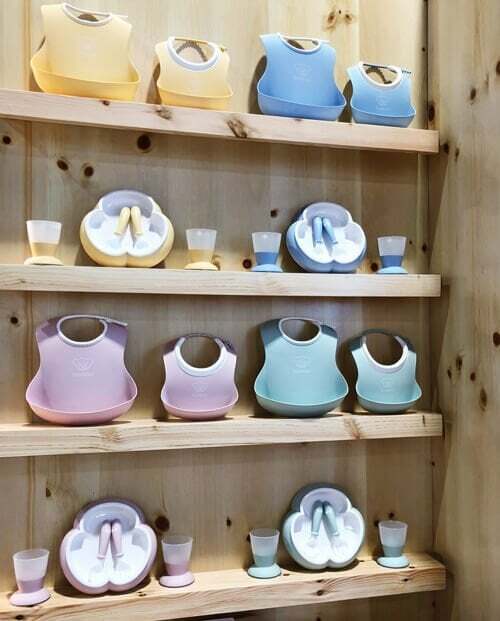 Tiny Twinkle makes a variety of baby products using Kaffle, which is a waffle wave from Korea. It’s soft, breathable, dries quickly, and is highly absorbent. Their bibs are two layers of Kaffle fabric surrounding a waterproof polyurethane laminate center. AVAILABLE NOW FROM AMAZON. 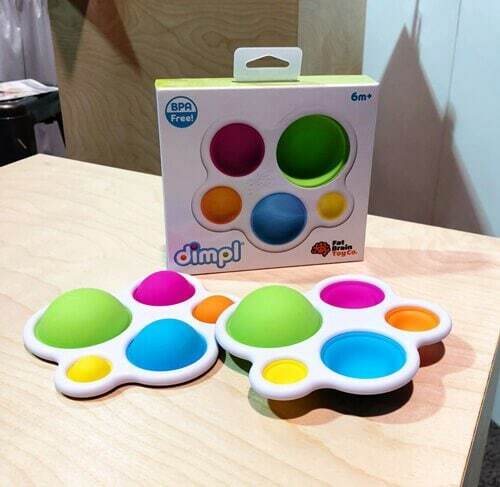 The Dimpl is essentially bubble wrap for babies! So simple & smart! AVAILABLE NOW FROM AMAZON. Miniware is beautiful and functional tableware for kids made mostly from food-grade silicone and bamboo fiber. It is eco-friendly, both because of the material it’s made out of and because the dishes grow with your kids. One of the features I love most is the secure suction-cup base that can be used on all of their dishes, and later removed when it’s no longer needed by your child. AVAILABLE NOW FROM AMAZON. The EZPlay Jungle Gyms are indoor playgrounds that can be folded up and stored when not in use! The Panda Playground (pictured) is the smaller jungle gym and features a wooden ladder, rope ladder, slide, gymnastics rings, and a swing. AVAILABLE NOW FROM AMAZON. The Dare-U-Go is a bib and plate in one! It features three food compartments and the bib folds down to seal the food compartments. Made from food-grade silicone that is top-shelf dishwasher safe. AVAILABLE NOW FROM AMAZON. Unfold a throw pillow to discover a themed playset! Choose from a doctor’s office, kitchen, or dollhouse – each one comes with secret pockets and accessories. Pack it up for on-the-go play. AVAILABLE NOW FROM AMAZON. Babyletto is coming out with their first bunk bed! 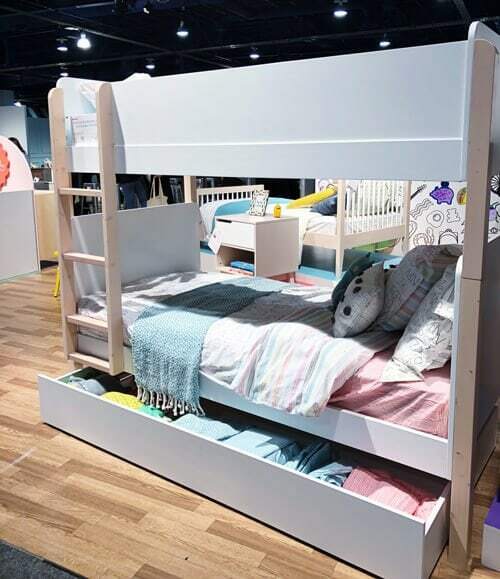 The Tip Toe Bunk Bed will easily convert from a bunk bed to two twin beds and back again, plus you’ll have the option to buy a matching trundle with lots of storage. AVAILABLE SUMMER 2019. These felt animal busts aren’t just adorable, but they’re going to be priced at under $25!! 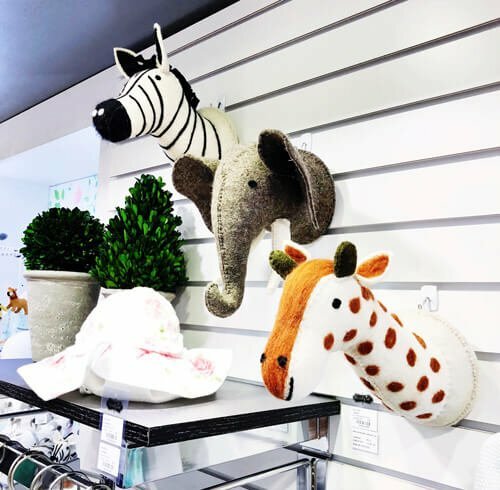 Choose from a giraffe, elephant, zebra, and swan. AVAILABLE IN JANUARY 2019. There are so many things to love about the Collapsabottle! It collapses down to the size of a hockey puck taking up minimal space in your cupboard or diaper bag, and the unique collapsible body expels unneeded airspace reducing baby’s air intake. Once your child is ready, the bottle can easily be converted to a sippy cup by replacing the top and adding handles. It features a tip-proof design, is easy to clean (no bottle brush required! ), and is dishwasher safe. AVAILABLE NOW FOR PRE-ORDER FROM COLLAPSEANDGO. The BOB Revolution Flex is getting an upgrade! The new model will have more seat padding for your child, a larger under seat basket, reflective strips, and a quiet-close chat window. Also available in new colors! AVAILABLE NOW FROM AMAZON. All of the shoes from Le Petit Chouchou are all adorable, but my personal favorites are the Dragon Sandals! Made from vegan leather, and available in sizes 0-6 months up to 18-24 months. AVAILABLE NOW FROM LE PETIT CHOUCHOU. This 10-piece set includes everything needed to play doctor, nurse, or EMT! All the tools – a stethoscope, reflex hammer, syringe, forceps, thermometer, and otoscope, as well as a doctor’s notepad and two sheets of assorted stickers – can be stored in the ambulance. Then flip up the lights to create a carrying handle. AVAILABLE NOW FROM AMAZON. 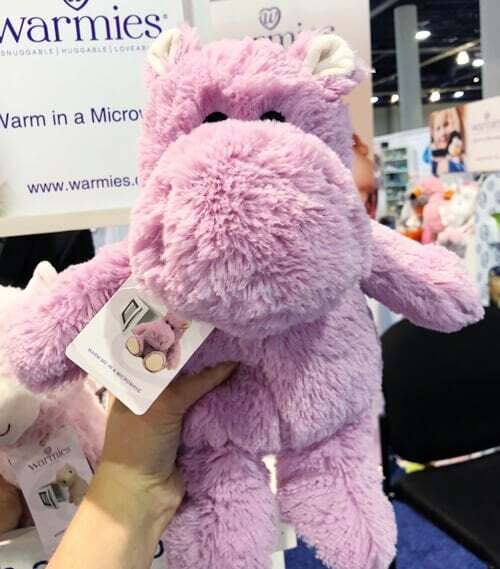 You can see all past ABC Kids Expo posts HERE. Such a great list, I’ll definitely let my mom friends know!